When people ask me what I do for a living, I’m often hesitant to reply at first; ‘I’m a guitarist’ often makes people look at you as though you are a pubescent 15 year old who needs to find a ‘real job’. You get a nod of the head and an “Oh, that’s interesting…” but of course that person now thinks of you as a moron, and is already disregarding everything you are saying. First off, you can’t survive by being one OR the other on their own. 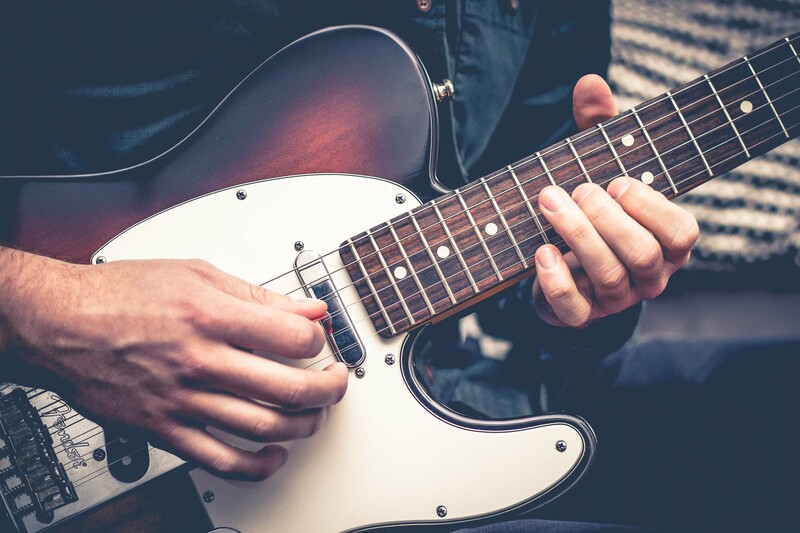 To be able to support yourself to the standard of a ‘normal’ lifestyle, you’ll need to be working as a regularly gigging musician (approximately 80-90 gigs in a calendar year), as well as clocking in for as many hours teaching as you can. In order to be supporting yourself if you think you might be able to ‘make it’ with your band, the most recent identifiable benchmark is to be as big as Royal Blood. If you aren’t that big yet, don’t give up the day job. Weekdays and weekends are animals of an entirely different nature for the average musician. Weekdays consist of waiting to teach privately in an evening, or may indeed be taken up in schools, attempting to deliver classes on your chosen instrument. I myself do a few days a week in schools and then fill in 3 evenings as well. This leaves me spare time to practice for my own development, and to work on expanding repertoire for my second job; the afore mentioned ‘guitarist’ role. Saturdays are the main gig day for us musicians – people want to go out then, get married then, have parties then – you get the idea. So we get up early because people also like to take their kids for lessons on Saturdays too. We teach until maybe 2pm, and then we get ready for round two – the gig. Being a Yorkshire wedding band is good – you’re in a good fairly central location, which means travelling isn’t too bad; maybe two hours in any general direction is considered reasonable. So you drive to a meeting point with your fellow band mates. These guys usually follow the rough template of; 1 knackered guy who is balancing 30 hours of teaching, a toddler and a busy gigging schedule; 1 friendly guy with a cracking beard; 1 person who is just plain strange (usually the bassist); and one guy who’s always running half an hour behind time. This ladies and gentlemen, is a proper wedding band! You share a van ride for 2 hours with these band mates, who are something of a hybrid between friends and family, discussing all manner of topical issues. You will at this point also stop for the inaugural McDonald’s of the day. 4pm is a pain in the neck time, you know you’ll be gigging later and unable to eat, but also you aren’t really that hungry at 4pm. Experience tells you to play it safe, and ‘just eat something…anything’. 6pm is generally arrival time at the venue. You smell a bit from sharing a van with 5 other males, and you’ve dribbled ketchup on your white shirt, so you put a blazer on to cover up the stain whilst also appearing much smarter. Excellent. It’s also at the point that you discover that the wedding is running about an hour late due to someone’s speech over running by 40 minutes (usually the father of the bride). Fast forward to 8pm and its first dance time. Two awkward looking figures shuffle into the center of the dance floor and it is at this point that all the pressure is on you. Do. Not. Mess. Up. They know this song rather well, they’ve personally request that you play it for them. It probably has some deep-rooted meaning to them; they don’t care that you only had 2 hours to practice it – just get it right and smile! This really is what you are paid for, performing under a bit of pressure. It’s a gulf that a large proportion of aspiring musicians unfortunately can’t get across – the nerves. Midnight rolls around and you are now pretty tired. You’ve probably been awake around 16 hours since you began teaching, which now feels like yesterday. (Funnily enough…) It’s now time to pack down all your gear. Sadly not many bands can afford to employ a roadie so a miraculous transformation occurs – no longer are you the cool bloke onstage performing an eclectic guitar solo – you are the invisible man who nobody recognizes, carrying a 48-kilo speaker down some stairs. The drive home is much the same as drive there. You discuss how that certain bridesmaid was definitely eyeing you up (not the singer, much to his disbelief), and you stop off for your second McDonalds of the day. Nobody wants a salad at 2am, ever. So that’s pretty much it – how the average day can pan out for a working musician. Or indeed, a guitarist! Some days are longer than others, and at some points you may think I’ve been complaining about doing this for a living. I can assure you this is not the case. I love being a guitarist, teacher, or even a musician for a living; I literally get paid to do what I love, which is more than most people can say.